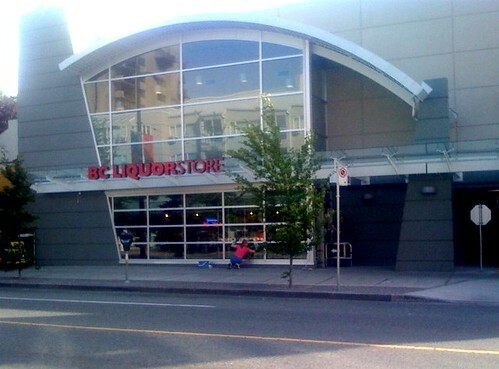 I remember the original liquor store that closed down on Robson, between Bidwell and Denman. It was supposed to re-open with the rebuilding of a Safeway but due to delays in that project, the liquor store building lay vacant for years. When the new Safeway was finally built on Denman and Robson, welcoming ground-floor tenants such as CIBC and Vancity, the BC Liquor Store wasn’t far behind. We walked by today and it seems open if not very close to opening. It will definitely be convenient when walking home from Safeway and wanting to grab a nice Pinot Noir to accompany dinner (although I can already see the line ups forming for fireworks nights). As a side note, the CIBC will host a grand opening BBQ celebration Saturday May 30th where you can enter to win an autographed Trevor Linden jersey. Rumor has it there will be a magician and caricaturist on site as well.